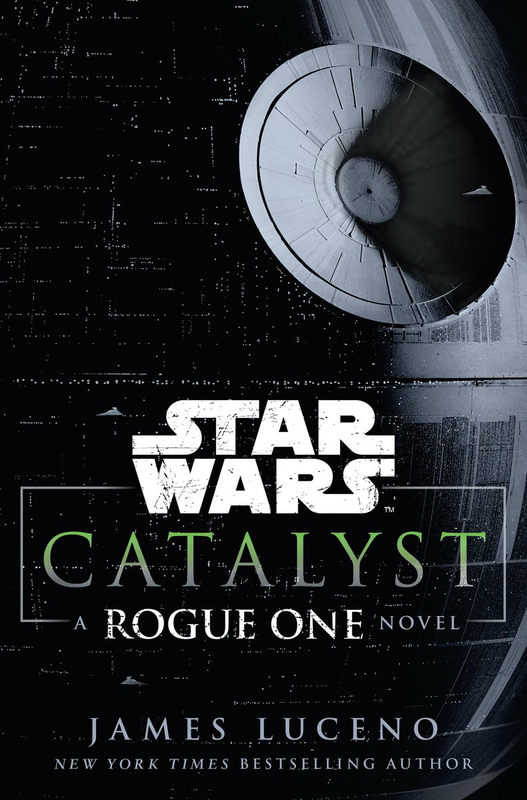 Catalyst makes for a good set-up to Rouge One; I certainly feel like I will have the upper hand in understanding the chain of events in why things start out the way they do when I see the movie. The prose is middle grade in order to be commercial, I get that, but there were many times in which I had to restrain the editor within. But if you love Star Wars, you can probably ignore that for the sake of plot and lore. I feel like a lot of emotion was sacrificed in favor of a plot-driven story–but again, that is to be expected from a commercial read. I think the actual Rogue One movie will be much more gritty and emotional than the book could portray. I wish I would have seen more of Galen and Lyra’s relationship. They seemed distant throughout much of the book, and I know that was the point because Galen was so engrossed in his work and so in his own head all the time; but I really wanted Lyra to just go at him way more than she did. Her interactions with others often seemed stilted, but her inner dialogue reveals much more. On the subject of Lyra, I think she’s a great precursor to what we can expect from Jyn: inquisitive, rebellious, and independent. Being an transition period in the galaxy, it was interesting to learn that everyday citizens didn’t really think the Empire was something bad to begin with–much of that is due to the fact that the Empire suppressed a lot of information and sold the narrative that the Emperor was a benevolent being in pursuit of eternal peace. To an extent, the Ersos represent those on the ground, ordinary people who are sold the story that the Jedi rebelled and the Empire only wants peace, but obviously they soon learn the contrary…the hammer of the Empire falls hard and fast. Orson Krennic is a standout villain due to his deft manipulations of those around him to achieve his ultimate goal of completing “Project Celestial Power.” The rivalry between him and Tarkin was to expected given all the power plays within the Empire, so I wouldn’t be surprised if Tarkin somehow shows up in Rogue One. The smuggler-turned-agent Has Obitt seemed a bit pointless at first, but later becomes a convenient plot point. I’m wondering if he might be in the movie as well? For those who want to know: Yes, we meet Saw in the latter part of Catalyst, and yes, we find out the name of the planet (Iceland) we see the Ersos on in the Rogue One trailer. Over all, the characters seemed distant and sometimes stilted. This book is much more plot-driven than character-driven, which isn’t exactly my cup of tea, but I appreciate the new Star Wars lore.